Friends, we have a very important update in regards to pettable animals in Battle for Azeroth. If you’ll recall from our gallery, we really wanted pettable dinos. Boy do we ever have a boatload of pettable dinos for you — if you’re Alliance, that is. That’s right, once again it seems that pettable creatures appear to be an Alliance activity to enjoy. We’ll discuss that in a moment, but before we do…how do you get your hands on all those tiny agreeable dinos? Turns out it’s easy enough, as long as you’re working on your reputation with the 7th Legion. 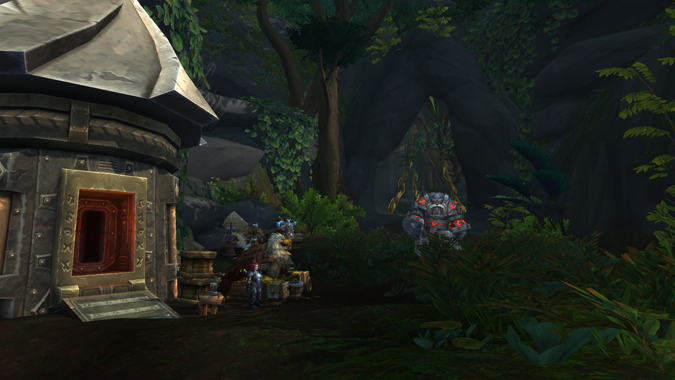 At each reputation level, you can purchase outposts to unlock on Zandalar (and vice versa, if you’re Horde). At Revered, you’ll want to pick up the Verdant Hollow outpost and run the mission — once you’ve successfully completed it, you can travel to that location and unlock a flight path. But it’s what happens after that’s important. Return to your mission table and look for a new mission titled Dino Research. The reward from this mission is an Outpost Upgrade, which applies to the happy go lucky soliders over at Verdant Hollow. Once you’ve completed the mission, you’ll get a quest to return to Verdant Hollow, and surprise surprise, it’s been overrun by a multitude of dinosaur hatchlings…and you can pet every single one of them. Now you may be wondering, “Exactly how is this an outpost upgrade?” And my reply to that is simply to return to Verdant Hollow and indulge in some nice dinosaur pets. Enjoy their love. Observe their antics. I mean…yeah, it’s not exactly anything that I’d call particularly useful, but it’s a delight to behold — and don’t we deserve some delightful things every now and again? Yes, yes we do. Unfortunately, in all my research I was unable to find a Horde equivalent. This will not do — we’re in Horde territory! There should be loads of dinosaurs for Horde players to pet, they’re all over the zone! Rest assured, over the next week or two I am going to indulge in a deep investigation of all things Horde, specifically things to pet, and if I find anything, I will immediately report it. I’m all in, guys. But you know what? This isn’t the only Outpost Upgrade out there. Meet Spud. He’s big, he beefy, and you can unlock him at Grimwatt’s Crash in Nazmir. Spud is much more useful, if that’s what you’re looking for — you can hop on Spud for an ultra-fast mount that you can pilot across the zone to get to those far-off places that don’t necessarily have a flight point. With a zone the size of Nazmir, that’s way handier than just petting a bunch of tiny dinos. 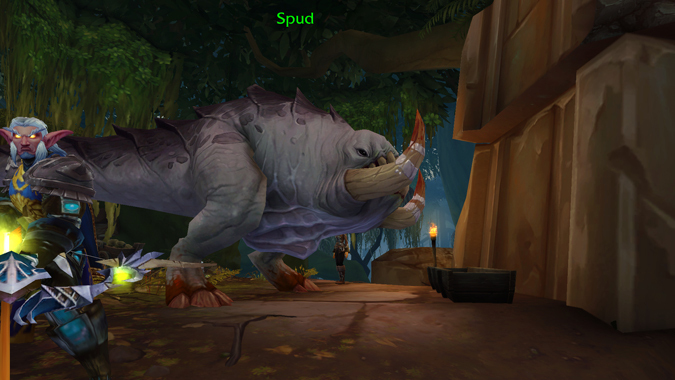 Fortunately, Spud does have a Horde equivalent. At the Horde outpost in Stormsong — Stonetusk Watch — the Outpost Upgrade unlocks Donk, a super-speed Ettin that will happily cart Horde players all over the zone. Stormsong is also a pretty gigantic zone with not a lot in terms of flight points for Horde players, so Donk is a handy addition. Upgrades to outposts aren’t necessary for any kind of progression — you don’t really have to do them if you don’t want to. 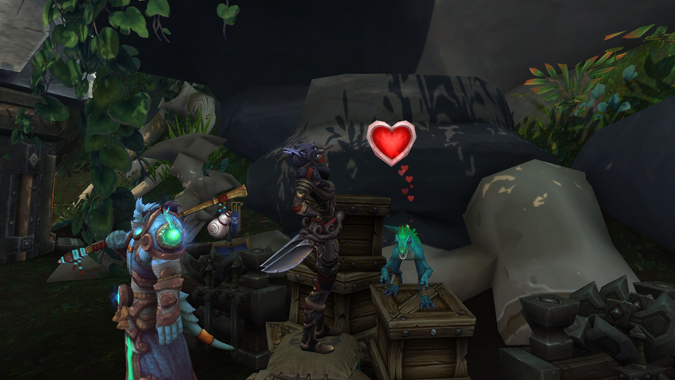 But they do offer some handy little updates — both Horde and Alliance have an option to add a scrapper at one of their outposts as well — and they throw in some additional flavor on top of it all. There’s nothing wrong with a little flavor! So when you’re out there hitting all that reputation, don’t forget to unlock your outposts. If nothing else, you’ll get a new flight path out of the bargain, which makes doing all those dailies just a little easier. But while you’re unlocking the outposts, keep an eye on your mission table for those Outpost Upgrades too. And most important of all — make sure you unlock all those sweet sweet dino babies and give them all the pets they rightfully deserve. If you’re looking for more things to pet in Battle for Azeroth, don’t forget to check out our gallery — now updated with wee little dinosaurs as well.